Alternatively, new fresh data for a Dimensioned Report can be collected on demand (only when the Report is opened in the Viewer or sent in a Digest, etc.). Current article describes this method. NOTE: This method is unavailable for Reports sourced from CSV and Excel and Snapshot Reports (How to create a Snapshot Report). If you create a dimensioned Report from scratch, you can follow the general instructions in this article: Create a Dimensioned Report. Collect data: choose 'on Report Request'. Expire on start of: choose a Data Collection Trigger from the drop-down list. 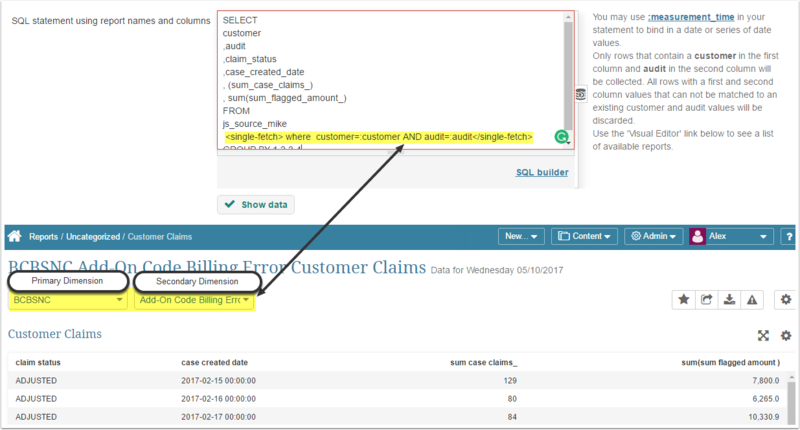 Cached reports should be expired at the start of the associated data Collection Trigger to avoid a cached version generated before the most recent data collection event from being displayed / sent. Another great way to set up targeted Data collection is to set up single fetch for Reports with Compound dimensions. This condition is used to collect data for one specific instance (with data for a specific combination of primary and secondary dimension values). When another combination of primary and secondary dimension values is created, the system generates a new instance on the fly. Combining on demand Report collection with single fetch settings creates perfect environment for enhancing system capacity. Instead of "collecting everything all the time", only the required data is fetched just when it is needed.